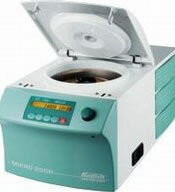 High-speed 14,000 RPM refrigerated 24 Place microlitre centrifuge, with Fast Cool function (+4°C within 10 to 15 minutes) for microlitre samples. Even thermosensitive samples can be gently centrifuged thanks to highly reliable refrigeration. Best separation results are guaranteed with the smooth-running, high-performance motor featuring a maintenance-free frequency drive. With the autoclavable and aerosol-tight accessories, even infectious materials can be processed safely for both the user and the environment.